Interview with Robbie Bagley, director of the incredible 'Rey: A Star Wars Origin' fan film – AiPT! Since the release of The Force Awakens in 2015, Star Wars fans have been speculating where Rey came from and who exactly left her on Jakku. No matter who may have been the one piloting the ship we see in Rey’s flashback, it’s very bizarre that someone, ANYONE would leave a little girl stranded on a desert planet with the likes of Unkar Plutt. There are a lot of questions to be answered there and with The Last Jedi only a couple of weeks away, we’re supposedly getting some of those in the latest installment. The filmmakers at Working With Lemons however, started a project of their own and took a stab at answering just why Rey was left behind. There’s a lot that goes into making a great fan film and these guys definitely hit a lot of those beats. The story feels well thought out, the costumes are great and most impressively the set, which is an interior ship, is incredible looking. Clearly a lot of effort went into creating the interior of this space craft. All of these aspects really help bring you into the story they were telling and left me wanting more. There’s a good chance Disney is going to tell this part of Rey’s background, but for now I’ll gladly take this as the beginning of her journey. 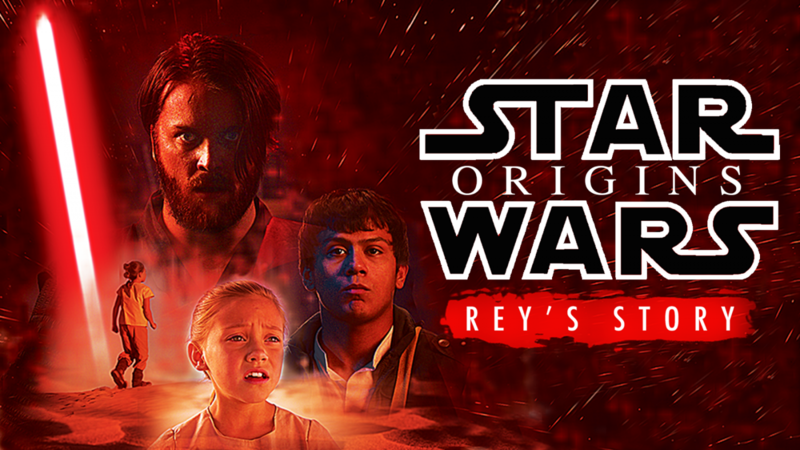 You can find the video below for Rey: A Star Wars Origin Fan Film, and after that I got a chance to ask the director and editor Robbie Bagley a few questions. Hats off to the guys and girls at Working With Lemons — I look forward to seeing more Star Wars from you! AiPT! : What was the catalyst for choosing Rey’s origin story? Robbie: There are so many questions that weren’t answered in Force Awakens about Rey on Jakku. We feel like there’s a lot of story that could be told that people would like to see. AiPT! : Was there any concern of the story being different from what The Last Jedi will inevitably tell? Robbie: We definitely tried to keep the parts of our story that involved Rey as ambiguous and open ended as possible. We knew that no matter what it would be a challenge to tell this story and not end up clashing with what we might learn in future films. So, we did as much research as possible, gathering little bits of info here and there from interviews, books, you name it. We took that info and hopefully we were able to tell a micro story set moments before Rey was left on Jakku that will fit within the future canon of the saga. But at the end of the day we really just wanted to tell a fun "what if story" with one of our favorite characters and introduce some new ones. Little Rey Rey isn’t messin’ around. AiPT! : Well I’m glad you decided to go with this angle because I feel it’s a story not many would think to touch upon. I know this film just dropped but have you begun any plans for future installments or is it more of a “wait and see” type of thing? Robbie: We definitely have tons of ideas rolling around inside our heads for future installments. We have lots of props, costumes, and set pieces ready to go for another episode. Whether we jump into production early next year or not will depend on the response to this first episode and if fans want to see more. We feel confident that if The Last Jedi reveals something about Rey’s past, we can work that into episode 2. AiPT! : Looking toward possible future installments, would we expect Rey’s story to continue, or are we looking more of a shift to Rykker’s point of view moving forward? Robbie: Both! We’d love to continue following Rey’s story on Jakku as she becomes the hardened scavenger we meet at the beginning of The Force Awakens. There are so many questions that can be answered. How did she learn to fight? How did she learn to pilot a ship? We’d also continue following Rykker and his pirate gang’s story as they continue to hunt down relics of the old Empire, like Darth Vader’s lightsaber we see in this short. AiPT! : What was the biggest hurdle to getting this film made? Robbie: Building a space ship. We spent over a month nearly every day planning and building the set. The morning of the first day of shooting we finally finished and it was then that we realized that the film was going to look good and work. Up until then I wasn’t sure if the ship was going to look like it was made out of wood. The most frustrating thing about making a Star Wars film is there are millions of people that would love to help this project by making props, VFX, costuming, funding, etc, but they just don’t know about it. We hope to build a team of people who love to make Star Wars origin films because there are plenty of origin stories that haven’t been told yet. AiPT! : Do you have any tips for would-be filmmakers looking to make a Star Wars fan film? Robbie: Get out there and do it! Everyone has access to a camera on their phone nowadays. So, if you have a story you want to tell, get your friends together, write it out, and shoot it! I think most people have a movie they’d like to make or a story they’d like to tell. Most people just never take the step of actually doing it. AiPT! : Finally, on a scale of Teedo to Luke Skywalker, how excited are you for The Last Jedi? Robbie: I’m Han Solo because after seeing that last trailer for the movie I was dead! Can’t wait.